"No child belongs to one house." Adapted from GOING TO THE MOUNTAIN by Ndaba Mandela. I went to my room, feeling like the exchange had gone as well as it could have. “No blood, no foul,” as they say. Until a few weeks later when I lost my jersey again. I was shaking in my shoes when I had to go tell him, trying to come up with any possible Plan B. Run away. Go to a different school. Try to find any conceivable way to blame it on someone else. Try to look as pathetic as possible and stir sympathy. There was no sympathy. He was straight up furious. The personal responsibility talk went to another level, and at the end of it, he didn’t offer up Rochelle getting me another replacement. What could I do? I slunk down the hall and out the door. The shadows were already long. It was dusk. It would be dark soon. The yard was surrounded by a high wall. I figured if bad guys tried to climb over it, the security people would come out and stop them. Theoretically. I found a fairly comfortable spot on the grass beneath a blue guarri tree, but I wondered if there might be snakes in the sneezewood trees and wisteria surrounding the pool. It got dark. The heat of the day faded off. I sat there shivering, arms hugged tight around my knees. I just about jumped out of my skin when I heard Mama Xoli call my name from the kitchen door. Startled but relieved, I ran to meet her as she walked out under the yard light. I assumed she’d come to take me inside for supper. That was not the case. I tried to say “thank you,” but there was a lump in my throat. He was serious. He was going to make me stay out here all night in the cold with no food and probably poisonous snakes and potential thugs and assassins maybe climbing over the wall. Mama Xoli went back inside, and I swallowed hard. My eyes were burning, but allowing myself to cry wouldn’t have done me any good. I wasn’t one to cry, even at that age. Maybe for something physical, like the time my friends and I faced down the tear gas-belching Hippo, but this was a thousand times worse than that, because I was alone, and I’d made my granddad so angry, and sooner or later I’d have to face him again. So be it. Come what may, I was not going to cry. Because a Xhosa man endures. This is what we say when we greet each other. “Ndi nya mezela,” says the other guy. I am enduring. I found a good spot to sit down and wrapped the blanket around my shoulders. Birds settled in the trees, whistling softly every time a breeze moved through the branches. After a while, I saw Mama Gloria inside the kitchen window, washing dishes and hanging the pots and pans. Supper was over. My stomach was hollow with hunger. I would have been glad for a bowl of the old rice with ketchup. Beetles chirped in the hedges. Somewhere far away a dog was barking in the cool darkness. I started to drift off but jerked awake when I heard heavy footsteps coming toward me. I scrambled to my feet and saw the Old Man crossing the lawn. He headed back toward the house, and I fell in beside him, trying to keep up with his great long stride. He was just starting his first year at big boy school. So that didn’t take long. I laughed long and hard. 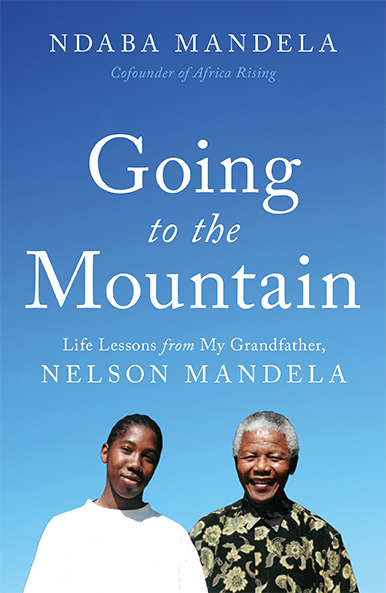 Adapted from the book GOING TO THE MOUNTAIN by Ndaba Mandela. Copyright (c) Ndaba Mandela by Hachette Books. Reprinted with permission of Hachette Book Group, New York, NY. All rights reserved. Nelson Mandela's legacy lives on as his grandson, Ndaba Mandela, continues to keep its beacon of hope bright, fueling its fiery message that one person can make a difference. Ndaba was recently named one of the "28 Men of Change" by BET and is showing the world, through his actions and orations, that Nelson Mandela's voice and message of freedom still rings true. Ndaba is the co-founder and co-chairman of the Africa Rising Foundation, an organization dedicated to promoting a positive image of Africa around the world and to increasing its potential for growth in the areas of education, employment and international corporate alliances for profit and partnership. Ndaba has also served as a spokesperson and ambassador for UNAIDS, which seeks to end discrimination around HIV/AIDS, reaching millions through the power of football. With his one-of-a-kind perspective and dynamic speaking style, Ndaba remains true to his inspiring grandfather's message.